With the introduction of two new coilover suspension systems, it appears that the folks at H&R feel the Audi RS3 "needs moar low." For the street, H&R's new "Sport" system lowers ride height by 20mm (front) and 25mm (rear), improving looks and handling without sacrificing comfort. 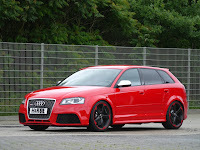 And for the track, the more aggressive "Clubsport" system offers full adjustability and peak performance. Press release after the jump. One does not necessarily expect 340 PS in a compact car nor the possibility to accelerate to 100 km/h in 4.6 seconds. However these values all come together under the bonnet of the new Audi RS3 sportsback. Fitting for the sales launch H&R has developed a sports suspension set for this compact car that brings its front axle around 25 millimetres and its rear axle around 20 millimetres nearer to the tarmac. 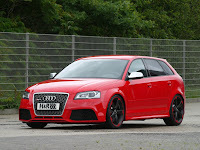 This not only makes the design more dynamic it also supports the driving dynamics of the RS3 a touch more. Despite the more direct contact with the driving surface sufficient comfort still remains for every day use. For more agile handling the suspension specialists from Lennestadt are offering a coil over suspension which keeping within TÜV approved values allows the vehicle's height and load on the wheels be individually adjusted. The Clubsport variant of the coil over suspension tackles the matter even more directly. Here the sporty design naturally is of priority. The soon to be available H&R sports stabilisers – made of special steel – can be used with all the aforementioned suspension products and the ex-works chassis. Highlights can also be obtained from the H&R TRAK+ Wheel Spacers made of high tensile aluminium – regardless of whether they are combined with works or tuned wheels. The unsightly gap between the wheel arch and the edge of the wing is thus a thing of the past. And in addition these measures have a positive effect on the driving dynamics of this small car. The low rolling resistance of the tyres has been kept – and still the vehicle has a wider track width. The full range of H&R products - available for over 1,500 different vehicle types – is available at all good specialist dealers and along with the expected H&R quality, comes with a general operating permit (ABE) or TÜV certificate of conformity for parts (Teilegutachten).